Layered with ripe red fruit, Etude Pinot Noir is paired with Stags' Leap, a Napa chardonnay with enticing aromas of honeysuckle and red apple, and arranged in a luxe picnic hamper with Napa's most delicious artisan chocolates and snacks. One bottle each of Etude Pinot Noir, and Stags' Leap Napa Chardonnay. For more information on these wines, please see the Tasting Notes. Smoked Paprika Almonds, Chardonnay Peanut Brittle. Sea Salt Caramels, Cocoa Nib Chocolate Tablet, and more. Your gift will leave a lasting impression as they continue to use and enjoy this picnic hamper, complete with leather lid, structured handles and secure enclosure. Personalize it! A name, date or message can be printed on ribbon, hand-tied around this gift. One line up to 45 characters; text repeats around ribbon. Or, add an attached silver hang-tag; choose a monogram or message of one or two lines, max 18 characters per line. Complete the personalization instructions at checkout. One (1) initial can be engraved on the olive wood surface. Enter information to be engraved during the checkout phase of the ordering process. Measures 14" x 11" x 9". 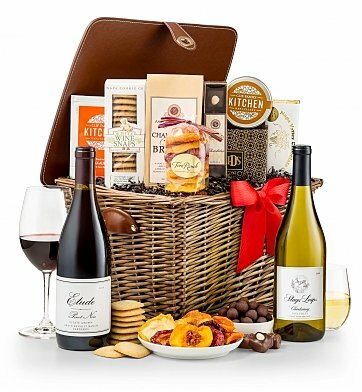 Napa Valley Wine Tasting Hamper is a hand delivered gift. These gifts are delivered by one of our local design centers located throughout the United States and Canada. Same day delivery is available for most gifts when ordered before the cutoff time. The cutoff time for Napa Valley Wine Tasting Hamper is in the recipient's time zone. Cocoa Nib Chocolate BarThe naturally nutty, smokey taste of fine organic cocoa nibs meets rich, dark 70% pure Belgian chocolate to create a delicious treat. Etude Carneros Estate Pinot NoirThe wine does an excellent job of balancing its ripe fruit, tannins, and barrel influence. The wine's bright finish makes it an attractive match with grilled lamb. Stags' Leap Napa Valley ChardonnaySweet pineapple and honeysuckle counterpoint French oak in this pleasing, highly-rated Chardonnay. The Carneros Estate Pinot Noir intrigues with its rich array of red cherry, wild strawberry, pomegranate raspberry and spice. The core of red fruit is made complex with layers of sassafras, sandalwood and baking spice that build in intensity through the finish. With an opulent mouthfeel and ideal natural acidity, the wine has significant substance and depth, yet stays lively and lifting throughout. Two Napa Wines: Etude Pinot Noir and Stags' Leap Chardonnay. Includes a free attached note card with your personal message. Arranged in a Leather Trimmed and Lidded Picnic Hamper.